Phantoms were a bad idea. They force the player to constantly micro-manage their sleep. Before Update Aquatic, I’d go into a cave, lose track of how long I’ve been underground, and then come up during night and hunt mobs. Now I need to keep sleeping, again and again. You can’t go on grand adventures across the world anymore, because now you need to constantly sleep in your bed (which loses your spawnpoint). You shouldn’t have to use F3 to remember where your base is. When the hunger bar was first implemented, it was criticized for forcing the player to constantly eat. But eating, unlike sleeping, is a large and immersive system. The hunger bar was required to make farms worthwhile and to pave the way for more food items. Sleeping is just clicking a bed. If we’re gonna add phantoms that encourage sleeping, we need to make sleeping a system worthy of encouraging. That means a complete overhaul. To be fair, sleeping hasn’t always been a bit of a mess. But first we need to make things easy to understand. Right now, the only way to know if you are in danger of phantom attack is by counting how long it’s been since sleep, and that quickly gets confusing on survival servers. I propose an “insomnia meter” is added to the HUD, taking the appearance of a phantom head. The semi-transparent head hovers over the experience bar. The transparency percentage correlates to the chance of phantom attack tonight. For example, at Night #4 of no sleep, there is a 25% chance of phantom strike. The head would be 25% transparent (as seen in the image above). The more visible the phantom, the more danger you are in. Once the phantoms make their first screech, a fully visible head appears to warn the player. Once the phantoms are defeated, the head returns to its semi-transparent status. As you sleep, this head slowly decreases until it becomes invisible again. Sleep bags are crafted with just wool and let you sleep without resetting your spawnpoint. 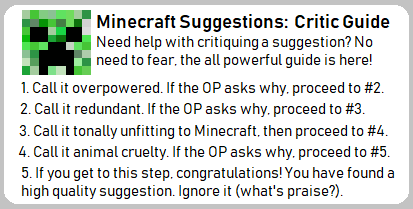 This is a frequently posted suggestion and I don’t understand why Mojang hasn’t added it yet. Sleeping Bags are especially needed due to sleeping’s new use: traveling to the dreamworld. Beds no longer simply speed up time. Instead, they teleport the player to a new dimension: the Dreamworld. 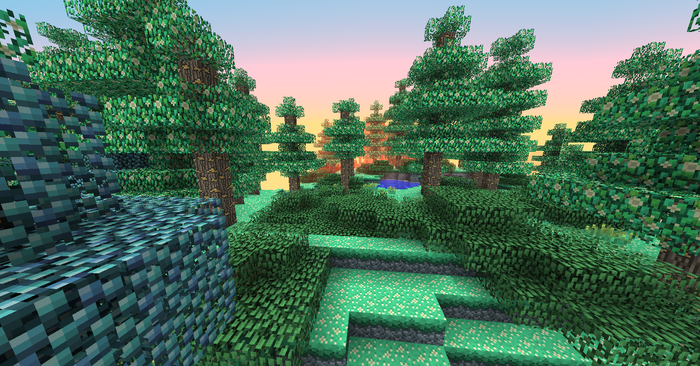 Imagine this, only with overworld blocks. The player is put in creative mode- this is a magical place, is it not? You can use a limited selection of cheats, such as /gamemode. The world is not infinite. Barrier blocks, like back in classic, limit the world to only chunks you have generated. This means you can only revisit places you have already been to in the regular world. To expand the dreamworld, explore the overworld! The sky has a dream-like color (see image), and never changes. The sun and moon rise and set as usual but the world acts as if in perpetual midday. The sun/moon’s location allows the player to know what time it is in the overworld. To sleep past a whole night, you’ll need to be within the Dreamworld for 10 minutes. No mobs naturally spawn, but you can add them with mob eggs. Only the player can edit the dreamworld, so mob griefing and fire spread is disabled. All ores are replaced by stone, to prevent abuse. Dungeons do not generate unless the player has “conquered” them in the overworld. Anything the player builds in the overworld appears in the dreamworld, however, anything you build in the dreamworld will NOT appear in the overworld. Every time the dreamworld generates, it checks for block updates from the overworld. If a coordinate with a block only in the dreamworld has received an update, it will update to accommodate the “real world”. To exit the dreamworld, fly up to y=256 or fall into the void. While you’re here, a model of the you is placed in the overworld and the chunks there continue running. If this model is ever damaged, you will instantly wake up. You may wonder, what’s the point of the dreamworld? Well, it isn’t your adventuring dimension like the nether or end. The point of the dreamworld is… to dream. Because it is identical to the survival world (your base already built) it’s a perfect place to test things. If I put the farm here, would I have room for the mob grinder? Would a quartz temple look nice? Is there space for redstone? Many players have a superflat or seed-copied world to test builds out, but then they must build everything they had from the ground up (or do some playing with the files) and they’d have to keep exiting and rejoining the world. But Minecraft is supposed to feel immersive, and this would be much more efficient. The Dreamworld is also a good place to go down memory lane by retracing your routes from past adventures. It’s even a great place to “practice”. By switching to survival, you could run the Wither boss fight again and again, figuring out the best strategy and items without the lose everything part. Most of this suggestion revolves around solving a recent issue the has come to Minecraft- the phantom- but there’s another, ancient problem that has plagued multiplayer since the dawn of survival test. Sleeping only occurs when everyone is at a bed at the same time. This is problematic, because someone might be in the far end while someone else desperately needs to get away from the phantoms. The small survival server I’ve been playing on recently has reached the point where everyone who can’t sleep gets off so those who can can. This shouldn’t be. By taking the player to the Dreamworld (instead of changing the server’s time of day) the problem is solved. Anyone can go to sleep at any time (including the day) to cure their insomnia or head to dreamworld for fun. It’s as if they went into a Nether Portal, nothing else is changed. Everyone’s happy. In multiplayer, each player has their own individual dreamworld. So if Cameron and I were to go to sleep, Cameron would go to his dreamworld (which only shows things he’s discovered, and things he’s built there) and I would go to my dreamworld. Even if we went to the dream nether and or dream end, we would be in different dimensions. This makes your dreamworld you own personal haven, free for you to plan and test however you’d like. Keep your plans to take over the server here. To enter another player’s dream, one must craft a Dreamcatcher, by surrounding a phantom membrane with four gold ingots. Holding right click with a dreamcatcher will launch a slow shulker-like projectile. If it hits a sleeping player, you will join their dream. The dreamcatcher only works on other players, so it’s useless in singleplayer (which is why it’s crafted and not dropped). The “host” of the dream is still in command and can banish a player from their dream with either the /banish command or firing a dreamcatcher within the dream at the unwanted player. When a player joins a dream, all inside the dream will receive the message “________ entered your/_______’s dream”. This ensures dreams are private yet collaborative if needed. That's it! Actually pretty simple, I only made this category for the pun. Clocks are a niche item, only coming in handy when underground. Even then, placing down a bed and checking to see if you can sleep is more efficient way to tell time. With sleep’s ability to change time removed, I thought it would be an excellent new use for the clock. "Why spend your precious gold on apples when you tell the T I M E"
The clock now has a placeable model that attaches to walls. When right clicked, the clocks position changes. There are twelve available options, ranging from sunrise to midnight. Feed some lapis into the clock, and you will use up four whole levels of XP. The time is then magically reset, with a message on chat explaining who changed the time. The gamerule /do clockTimeChange will disable this ability, if things get annoying on multiplayer. The more I spend on this forum, the more I realize how many problems there are with Minecraft. Don’t get be wrong it’s a great game, but nearly everything could use improvements. Some of these problems can be held off - we’ve gone a long time without an underground update, and while I’d love for Mojang to add one I can wait a couple more updates. But there are other issues that create glaring holes in gameplay, such as the one the phantoms caused with sleeping. It’s a new issue, so I hope Mojang recognizes and addresses the problem quickly. After all, what does the End Poem say? If you support this suggestion, please consider wearing this banner. The idea of Dreamland is very OP, but for the rest it is good, the idea of imsonio is one of the best ideas when seeing the Phamtom. Without a doubt it is one of the best ideas, and since they added it, I would not have given so much value to a bed. I'll admit, I haven't played 1.13 since I haven't played Minecraft in a while. However, from what I've heard about it, the implementation of the phantom seems to have been a terrible idea. How do you even deal with it on a server? Can you even stop them from attacking you? Anyway, onto the suggestion itself, while it sounds cool, I don't like the idea of not being able to skip nights. It's not like it still lets mobs spawn or crops grow while you're asleep, since you're in another dimension. As for the dreamworld itself, I don't want another dimension in the game without a purpose. Sure, you could test things there, but then, why not just make a creative mode world? Not to mention, allowing commands could be prone to exploits. The reason we don't have sleeping bags is because having to set your spawnpoint (and potentially lose it if you remove the bed) is the price for skipping the night. While this suggestion technically solves this problem, I don't like the solution. At the very least, I'd like the ability to still skip the night by activating your bed in the dreamworld, and remove the ability to use commands in it. However, I still don't see much of a reason for this suggestion overall. Minor Support. This is a good idea; I'd prefer a thermometer or a digital readout of time since last sleep and I'd prefer it was checkable in the player inventory rather than part of the onscreen display, but those are comparatively minor points that only affect [i]how[/i] it should be implemented. First, would you clarify if these are intended to access the dreamworld. [Your dreamworld section begins "Beds no longer simply speed up time. ", and goes on to describe the dreamworld beds access. If sleeping bags do not access the dream world it is unclear whether using a sleeping bag invokes the timeskip of the current beds. If this is not the case, how long a use is required to reset the time_since_last_sleep parameter? To what extent (if any) is a player subject to effects from mobs and/or the environment while using the bag? My understanding of the reason for the linkage of the spawn point reset with sleeping was a matter of balance: one skipped forward past the dangerous time, but paid the price of being linked to the sleeping location. Decoupling these effects makes sleeping a cost free means of avoiding dangers. From this quote (in the dreaming in multiplayer section) " Anyone can go to sleep at any time (including the day) to cure their insomnia or head to dreamworld for fun." it appears that the use of both bags and beds would no longer be limited to specific times. Including this information in the sleeping bag section would increase clarity. If a trivial [say 5 second] sleep is sufficient to reset the MobB threat counter and there is a method of doing so that does not alter one's spawn point, some of the objections to MobB behavior become muted. The removal of the timeskip feature would, however, remove the ability to skip dangerous times unless one was willing to play in the dream creative copy long enough for the danger to have passed. Rain and thunderstorms are both listed as lasting 0.5-1 MC day; players would thus be forced into the dream world for up to 20 minutes at a time if they wished to skip the hazard. While the dreamworld may be interesting for some purposes, removing a current ability is unlikely to be popular. The idea of an immersive alternative to using a seed copy creative world is interesting (and the changes to ore & dungeon existence and the limits on the accessible area are generally well thought out to prevent "cheating"), but this would certainly increase the storage requirements of the game and might entail considerable lag while updating the dreamworld with the changes since last accessed. Making the existence of the dreamworld optional during world creation would be preferable to simply adding it: those who want a more immersive creative version of their world can have one, but those who prefer not can avoid the overhead this entails. I'm far from sold on using the dreamworld, but these seem like a viable approach to handling the idea of shared dreaming. The idea of allowing any player to advance the time seems to me a very poor one. Single player sleep mods are available [You are likely familar with the effects of the one used on the Hermitcraft server]. Even on a highly cooperative server, there appears to be some occasional friction about whether the server should be day or night; what whould occur on a competitive server would be far, far worse. I'd not caught that bags and beds would now advance the world time only by the amount of time spent in dreamland until reaching this section. Repeating this information earlier when sleeping bags are introduced and beds discussed would make for a clearer presentation. If time passes in the 'real' world while a player is in dreamland, this implies that crops grow, ice melts/freezes, animals mature, redstone runs, etc, etc. These possibilities could be seen as advantageous as that would 'encourage' players to camp safely rather than dropping a bed in some random spot in the wilderness, but the need to advance both worlds simultaneously (and the associated computer overhead) would remain. If time advanced during sleep, it would also be possible to use sleep to (partially) dodge the hunger system as crops planted could be allowed to mature while one slept. I like the insomnia meter, although I would prefer a somewhat different implementation. I do not like the time skip clock idea. The sleeping bag needs some expansion: how long to reset the sleep-o-meter, access to dreamland, time skipping some of which may be covered implicitly in other sections. If the ability to time skip danger is retained but the spawn reset removed, it would seem desirable to add some balancing negative [or potentially negative] effect. Dreamland as an immersive alternative to a seedcopy creative world may be quite attractive to some players, but I see some [at least potential] problems that should be addressed. Making this an optional feature selectable at world creation is strongly recommended. Time advancing during sleep. This is the big change with far reaching implications. Exactly what aspects of the world do and do not advance while a player sleeps, as well as how these effect the player need to be more clearly defined. The crafting of the sleeping bag makes no sense. It would be more like 3 wool blocks or 3 wool carpet, no wood is needed. Also if you look a while back to my first post it was about dreams and the only person who replied to it was basically stating how horrible it was. I support the dreamworld if you give it a little more spice, like nightmares, or a mob that can access your dream and try to harm you in it, all the things it does to you affects your awake player, if you manage to kill it, it might give a good item that you get in the real world, idk, it seems like you just get commands and the seed. doesnt seem much fun. The Dreamworld is meant to be a creative environment within survival mode. It allows you to play creative within your survival world without cheating/changing the world forever. I'd completely agree about the price for skipping the night thing if we were talking about 1.12. But Phantoms force you to sleep. It's not a tradeoff anymore, it's a necessity to play properly. In the past you'd take the risk of going far away without respawning near, but no one would ever do that with 1.13 because Phantoms are actively seeking players who haven't sleep/reset their spawnpoint. Maybe instead of being crafted, the sleeping bag is found in dungeons? How does the Player's inventory interact with the Dreamworld? Are any changes to the inventory done in the Dreamland transferred to the Overworld? Upon arrival into the Dreamworld the player's inventory would be the same, and this can be changed with any block. By upon waking up your overworld stuff would return, even if you destroyed it in dreamworld. The Dreamworld runs parallel to the Overworld in time; sleeping whether with a bag or in bed takes the player to the Dreamworld where they must hang out for 10 minutes if they wish to skip the night. But the player is not encouraged to do this, if they want to change time use a clock. Time changing can be disabled via gamerule, so I don't think it should be a problem on servers. I suppose before time is changed the server could ask each player if they will accept the change, but this might just cause trolling. Mobs killing your within the Dreamworld is a serious risk, as you are vulnerable. This would encourage you to build safe bases before sleeping. In real life you do become hungry while asleep, so maybe the hunger bar could decrease as normal their? You could have a survival GUI with creative inventory. And you would see a desaturated hunger bar slowly go down until it forces you to wake up at one, where you eat. A problem that often shows up with dreams is how they would get in the way of someone who just wants to skip to day. This overhaul changes the entire starting motivation to sleeping, with dreaming now the main intention of going to bed. The point of dreamworld is to dream about what your survival world can become one day. I don't think hostile mobs spawning in a creative environment would fit, although, perhaps a nightmareworld found by sleeping in a "crypt" of some sorts in dungeons could contain these. Well, that addesses a small subset of my comments… looking forward to a reply to the rest. "they must hang out for 10 minutes if they wish to skip the night"
This is not skipping the night; it is spending it in another dimension. If players are not supposed to use dreamland to skip forward, entering that dimension should be an option when using a bed/bag; this would save the computational resources otherwise required to update a dimension in which the player would spend no more time than that needed to click out. This issue is quite likely a deal breaker and needs be addressed: either by confirming that it is possible to code this so as to require minimal additional load or by modifying the proposal. Based on the idea that there are lower social cost to adding powerful/abilities items than to removing them, the default for clocks time skipping should be off. I agree that getting consensus before a time skip is unlikely to be workable. "Mobs killing your within the Dreamworld is a serious risk, as you are vulnerable. This would encourage you to build safe bases before sleeping." "In real life you do become hungry while asleep"
Quite true, however MC physics already ignore the effects of all but a few activities (and the simple passage of time) on hunger. [As currently described dreamland reverts to a copy of the current version of the 'real' MC world everytime one sleeps. It would not, therefore, be possible to move back and forth using the dreamland construct as a template or to revise a structure over multiple 'sleeps'. I had not previously caught this, but it sharply limits the ability of dreamland to substitute for a seed copy creative world. Another, related, point: would dreamland include 'copies' of the relevant portions of the nether and the end? This suggestion is good, but it would interfere with players who do just want to skip the night. Maybe if all players sleep in a bed, the night advances at double speed, and there can be a gamerule to disable the dream dimension. Also, I'm not sure how I feel about the clock. I think the main purpose of all players sleeping to skip the night was made so it wouldn't interfere with other players. Oh wait, you said it should be toggleable by gamerule... ok all good then. So, I do think this suggestion is good, but it could interfere with some players in a way that could be fixed with minor tweaks, so I give this 90% support. I'll admit, I haven't played 1.13 since I haven't played Minecraft[/i] in a while. However, from what I've heard about it, the implementation of the phantom seems to have been a terrible idea. How do you even deal with it on a server? Can[/i] you even stop them from attacking you? This is seems to over complicate a simple issue of phantoms (unless you are counting how sleeping currently works as an issue too). I think the idea of an insomnia meter is okay, but if it's added it shouldn't be above the hotbar, but instead only present when in a bed. Crowding the hotbar and its surrounding HUD is not something desirable. Sleeping bags are great, and if added should be accompanied by hammocks (which would hang from ceiling blocks) for aesthetic reasons. Why would they have wood in their recipe, though? I think the sleeping recipe should just be the bed recipe without the planks. The dreamworld would have been a great idea before creative mode was implemented, but it's just too close to creative mode. I don't think it would add much to the game considering the length of time it would take to make it, even with it allowing multiple players in one dream. Instead, you should be able to have multiple worlds in one server without plug-ins. I completely agree that clocks should be able to be placed on walls. However, the ability to change the in-game time using lapis and just a few levels seems quite overpowered and annoying in multiplayer. If it's just going to be disabled by players, why even add it? I don't think it fits or makes much sense. Having sleeping bags would be great. However, I propose a different crafting recipe - same as beds, with planks replaced by sticks. Ok, I changed the sleeping bag recipe.